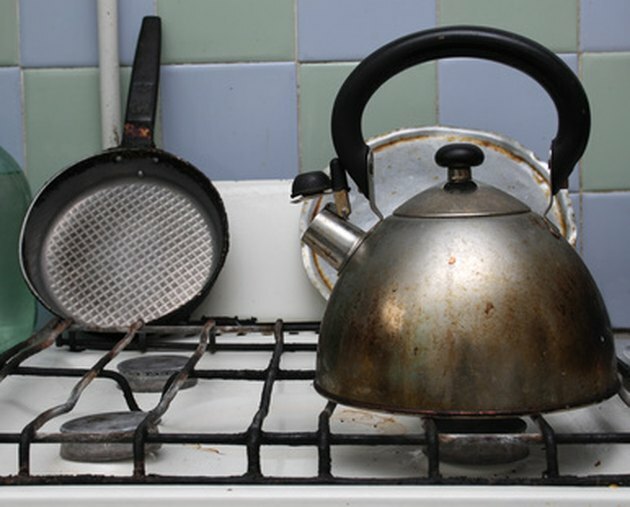 Enamel stove tops are subject to frequent use that often involves sticky, messy substances that can easily fall onto the stove's heated surface and get caked on. While your best bet is to clean up the spill as soon as the stove top has cooled enough to let you work, that just doesn't happen all of the time. If you need to do a more intense clean, you'll find that it's often an easy task that takes relatively little time. Remove dirt and grime off an enamel stove. Make sure the stove is cool. Take off all of the stove's exterior elements that block the enamel surface like knobs, drip pans and the rings around the burners. Remove the electric burners themselves, if you can pull them out easily. Dampen a rag or cleaning cloth and wipe off the exposed surface to pick up loose food particles and crumbs, or spilled dry goods like pasta. Clean the stove top again with a sponge dipped in dish soap and warm water to remove the less built-up parts of the mess. Mix together equal quantities of vinegar and baking soda in the glass container. Adjust the mixture by adding more baking soda until the combination forms a paste that is both moist and crumbly. Use a spoon to apply an even layer of the cleaning mixture across the stove top. Press the paste gently but firmly onto the enamel. Clean the parts of the stove that you removed earlier, washing them with warm, soapy water, while you wait for 15 to 30 minutes for the baking soda and the vinegar to break down the stuck-on food. Apply the credit card as a scraper to remove the bulkier but newly loosened pieces of food grime. Wet the rag from Step 3 again, and use it to wipe the remaining paste from the stove. Repeat the paste application on any stains that are still present, and let it sit for another 15 minutes. Scrape off the paste using the edge of the credit card again, and scrub the surface again with the cleaning cloth. Dip a clean rag in hot water and wipe it over the entire enamel surface to remove cleaning residue. Put back all of the clean accessories.